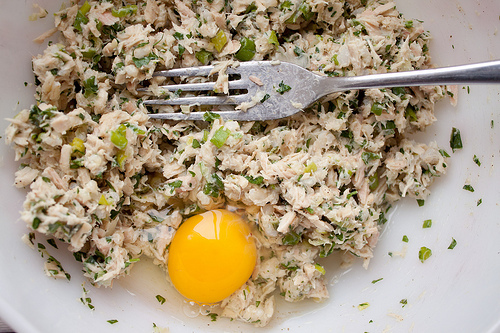 The American Heart Association recommends that we consume fish twice a week, and though the fish counter is not always budget-friendly, canned tuna certainly is. These burgers are reminiscent of plump, savory crab cakes, with bright notes of lemon and fresh parsley. And the best part: each one only costs $1.56! 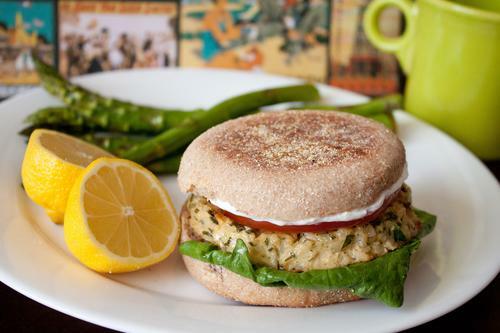 Tuna Burgers (makes 4) 2, 6 oz cans tuna fish, drained and flaked 1.98 1/2 cup cooked brown rice 0.30 1/4 cup finely chopped green onions 0.20 3 tablespoons minced fresh parsley 0.20 juice of half a lemon 0.35 3 tablespoons sour cream 0.30 1 egg 0.15 4 English muffins 1.25 4 leaves romaine 0.50 1 small tomato, sliced 0.99 ___________________________ Total: $6.22, or $1.56 per burger Combine tuna, rice, green onion, parsley, lemon, sour cream, and egg, and mix well with your hands. Form into 4 patties, place on a greased baking sheet and bake for 20 minutes at 400 degrees F. Serve the burgers on toasted English muffins with romaine and sliced tomato. Spread additional sour cream on each burger, if desired.